This entry was posted in Uncategorized on January 25, 2011 by Russ Nelson. This entry was posted in Uncategorized on September 28, 2010 by Russ Nelson. For some reason … for whatever reason … the TIGER data has some entire ways marked as being bridges.Â When examined, only a small portion of them is a bridge. I’ve been fixing them as I happen to notice them, but today I felt like seeking them out. I thought about writing a fancy program to parse the New York State section (as found on <a href=”http://downloads.cloudmade.com”>Cloudmade downloads</a>) to look for bridges. I fetched it with wget -O southern.osm ‘URL’.Â It’s only five megabytes and loads into JOSM easily. Once loaded into JOSM, you can see the very long bridges. They stick out like a sore thumb. I pick one, zoom in to fill the screen with it. I have the Terraserver Ortho WMS layer turned on, so I can see where the bridge really should be. Two selects of nodes, split the way, and delete the bridge=yes tag. I’ll have New York State fixed up in about an hour’s worth of editing (not counting the time to write this blog entry). This entry was posted in Uncategorized and tagged bridge, OpenStreetMap, TIGER on January 16, 2010 by Russ Nelson. Our humble abode for three days, at the ESRI User Conference in San Diego in middle July. Emma Lyons (Cloudmade’s summer intern) and I had a great time running this booth. We put it together pretty frugally, with a table drape for a sign, a couple of photo frames cycling through Best of OSM images. We gave away huge numbers of buttons and pens, and after the first day, we had Cloudmade-sponsored OSM T-Shirts to give away. Oh, we surely got popular THEN! 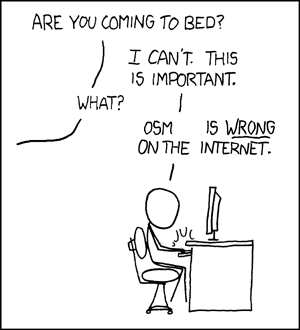 Talked to a lot of people about OSM. I used the line “Can I tell you about OpenStreetMap?” if anybody paused. Most people stayed to listen to my 30 second spiel. The booth cost us nothing because we were representing a non-profit, and given the contacts we made, was definitely worth the time. I encourage everyone to seek out opportunities to represent OSM at a trade show. 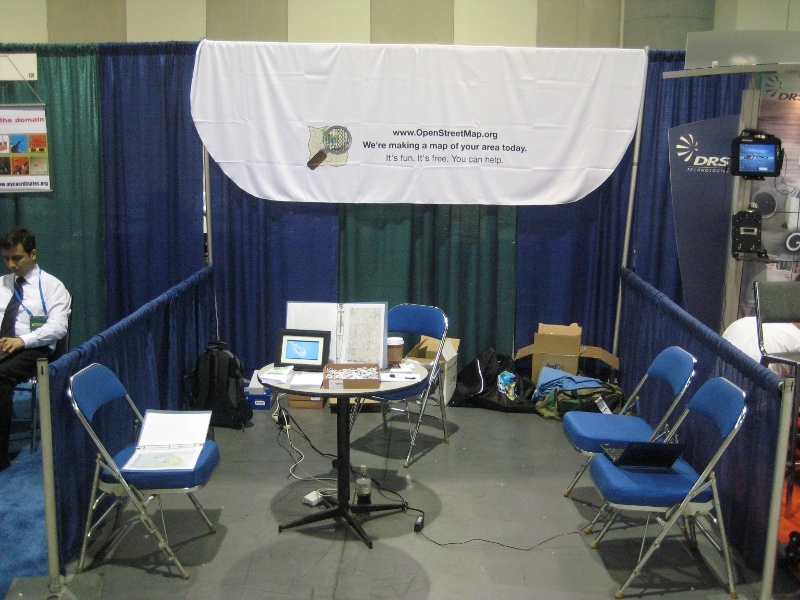 This entry was posted in Uncategorized and tagged tradeshow booth osm openstreetmap on November 29, 2009 by Russ Nelson. I’m SUPER excited about the Atlanta Mapathon being held this weekend. Not because I care about Atlanta all that much even though my in-laws are from Atlanta. No, because I suspect that a huge mapping party, like a code sprint, is the most efficient way to get an entire city mapped. There are only 30 big cities in the USA. If we can withstand the surge of new OSM mappers, and we have enough experienced mappers to be able to scale the process, we can get an (open) street map of the USA finished within a year. Probably not necessary to explain why it’s so important to have it be open. Probably is necessary to explain why the public domain doesn’t suffice. There are maps of the US already, produced by the USGS, in the public domain. The trouble with the public domain is that it’s not enough. You need a community who cares enough about the data to keep it up to date. I’m a board member of the Open Source Initiative. We spend a lot of time dealing with licenses, to ensure that the code is “free enough”. We actually have a definition of “free enough”, which is the Open Source Definition. But free isn’t enough by itself. We have over a decade of experience, all of which tells us that free isn’t enough. Free software, or free data, or public domain data, isn’t sufficient. You need an open community of contributors. And hopefully this weekend’s Mapathon will jumpstart that community within and without Atlanta! This entry was posted in Uncategorized and tagged atlanta, mappingparty, opendata, opensource on October 17, 2009 by Russ Nelson.